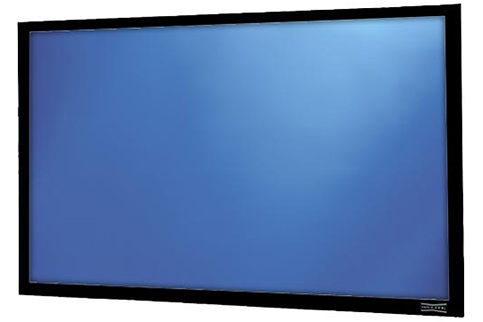 Perfectly flat, permanent wall-mounted screen ideal for video projection. Projection fabric is attached to the frame by Velcro. Black powder coated aluminum frame provides a sleek black masking border. Da-Mat, High Contrast Da-Mat, Da-Tex (rear), Pearlescent, Cinema Vision, High Contrast Cinema Vision and Dual Vision fabrics up to and including 12-feet high will be seamless. Audio Vision, High Contrast Audio Vision and High Contrast Cinema Perf fabrics up to and including 8-feet high will be seamless.